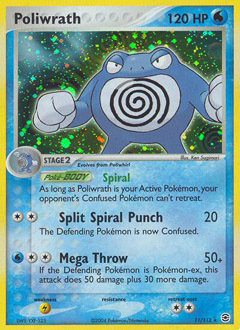 As long as Poliwrath is your Active Pokémon, your opponent's Confused Pokémon can't retreat. The Defending Pokémon is now Confused. If the Defending Pokémon is Pokémon-ex, this attack does 50 damage plus 30 more damage.